plastic bead on your line which freezes and also slows your line dropping. fishing! To Order 10 Light sticks click here. that a 2 year old to a Grandpa can use. 3 ½" bobbers, 5" bobbers and 7" bobbers. The 3 ½” bobber will hold up to a 1/16 oz. jig. Northerns, Lake Trout, and other large gamefish. easier to see from a distance when hole hopping (stand taller in the hole). Note: You can trim the bobber to balance your rigging for finesse fishing. pieces and thread onto the shaft of your plain hook to make a floater rig. down and immitate other products. 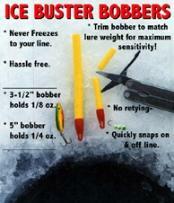 the World's 1st totally adjustable foam bobber!